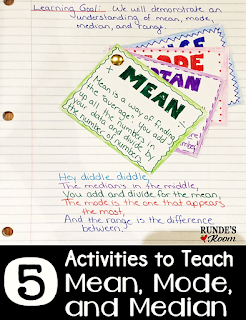 Today's 5 Activities to Teach ... is all about Mean, Mode and Median. 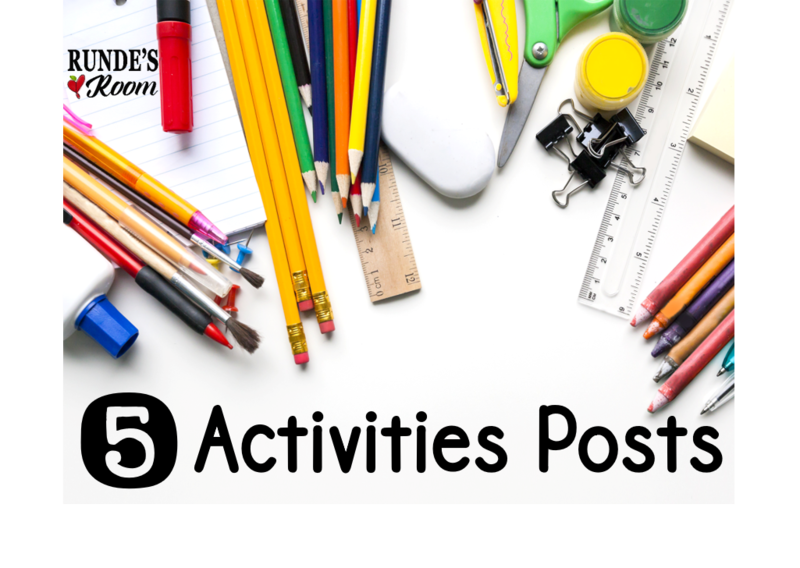 Get your students exploring these concepts in an interactive and hands-on way with some of these ideas. 1. 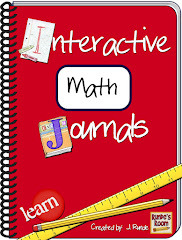 Interactive Math Journals - My favorite journal entry for mean, mode, median and range uses cue cards and a brass fastener. We write definitions for each of the terms on the cards, then fasten them all together and stick them to the right side of the page. On the left side of the page, we use a set of data and actually work through solving for mean, mode, median and range. 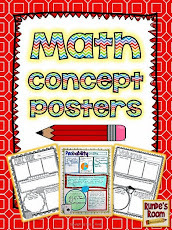 Getting this done early in the unit gives the students something to reference for the rest of the year when they encounter these concepts. 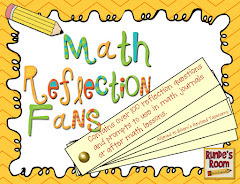 You can read a little more about this journal entry HERE, or find the full lesson in my Interactive Math Journal 2. 2. OREO Day!!! - Ummmm ... math and oreos ... life is good. This is one of my favorite days in the classroom - hands down. And it's not even the cookies - it's the stacking competition that I love (OK ... maybe it's the cookies, too). Students get paired up (each pair needs a package of cookies - I sent a note home asking parents to send in cookies and received more than enough). Each student then takes a turn stacking. 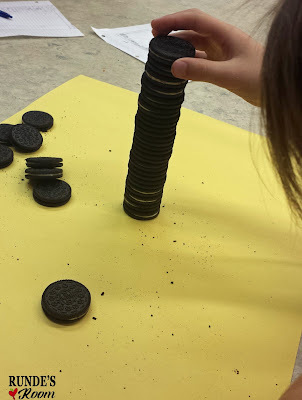 Rules are - using one hand only, and you cannot move a cookie once it has been placed on the stack. That's it. Keep stacking until your tower falls. The partner not stacking counts the cookies in the stack. I drew a big chart on the whiteboard to record the # of cookies. Each person got 2 attempts, so we had a large set of data when complete. Then, together we found the mean, mode, median and range with the data. Notes on this activity are included in my Interactive Math Journal, but you can also read more about it in my blog posts HERE and HERE. 3. 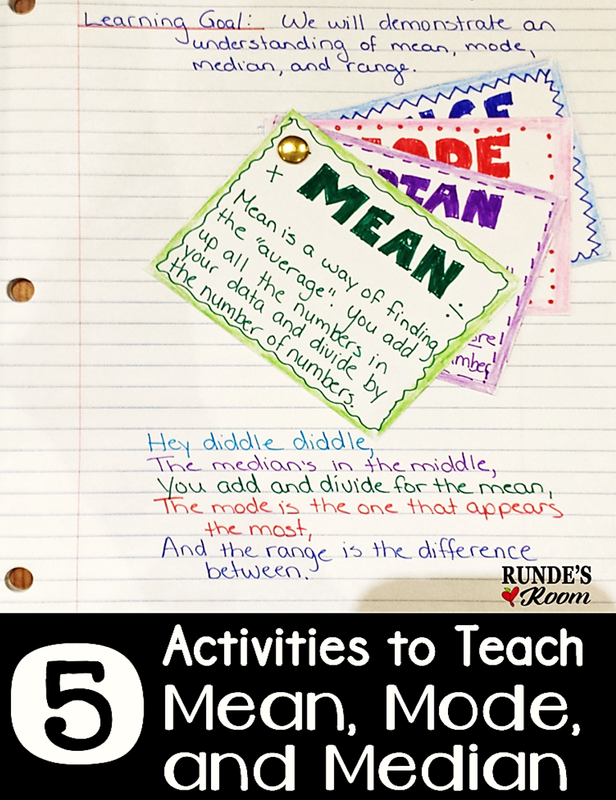 Hey Diddle Diddle - A few years ago I came across a great little rhyme for remembering how to solve mean, mode, median and range. It is based on the rhyme, Hey Diddle Diddle, The Cat and the Fiddle. 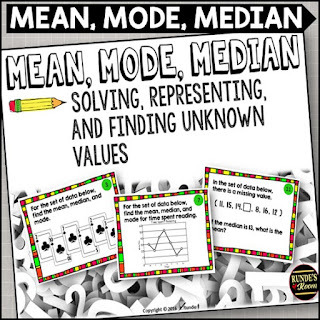 Every time we do a mean, mode and median activity in class, we recite it. I made a little printable with the rhyme, with a space for you to enter any set of data and room to solve for MMM. You can grab a copy of it HERE. 4. Use REAL Data - And use it often. Don't just teach it and leave it. 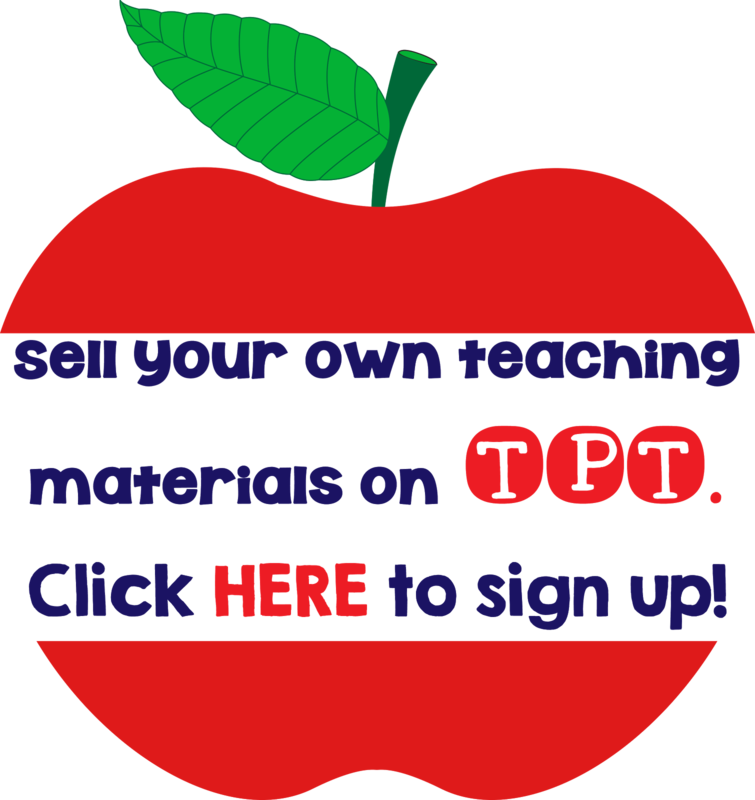 Keep the learning going with real data throughout the year. 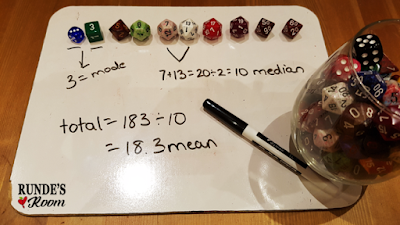 I like to do "Triple M" assignments (Mean, Mode, Median) whenever we get back testing data - whether it is a small quiz, or larger assignment where percents are given. 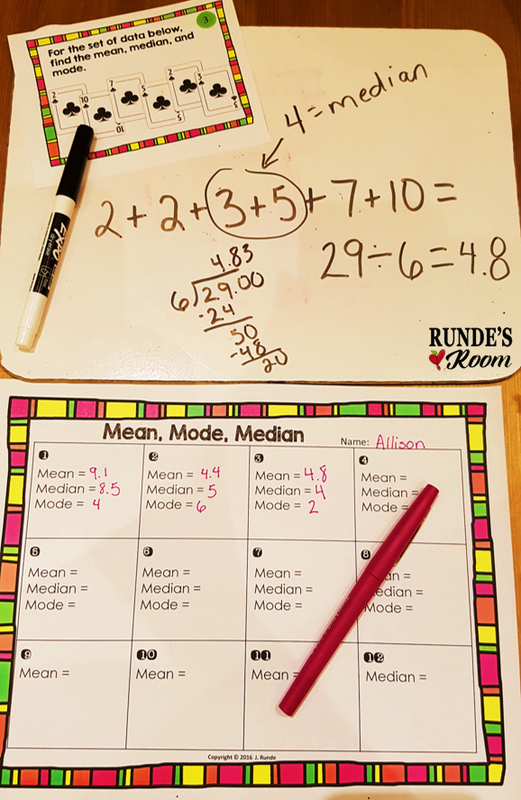 It's valuable practice for solving mean, mode and median, and gives students an idea of where their own mark is compared to the average mark in the class. 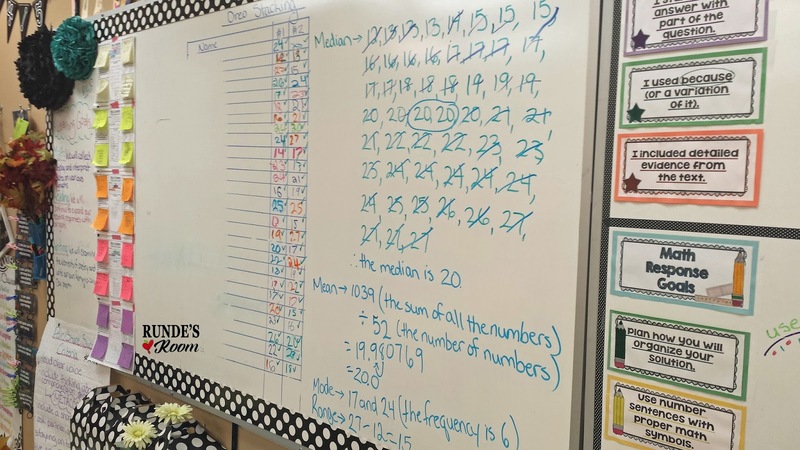 To do this quickly with grades 4-5, I use the Hey Diddle Diddle printable above, and write the scores in the data box in random order before I photocopy the page. 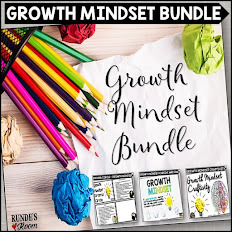 I also have a few larger assignments that I used with my students in grades 5-7, where students must plot the results on a line plot graph and reflect on the numbers in written prompts. 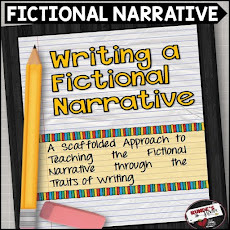 You can take a peek at those assignments (which also contains editable Word files) HERE. 5. 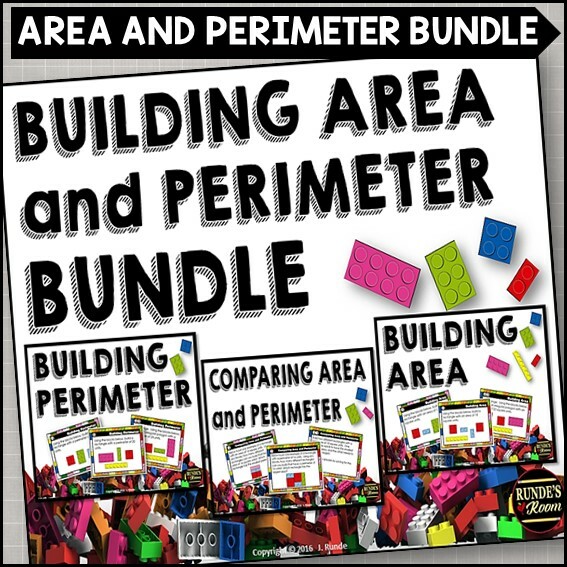 Stations, Stations, Stations - Again, since coming up with more math stations for next year is my main purpose for these posts, I've got some more station ideas for you. 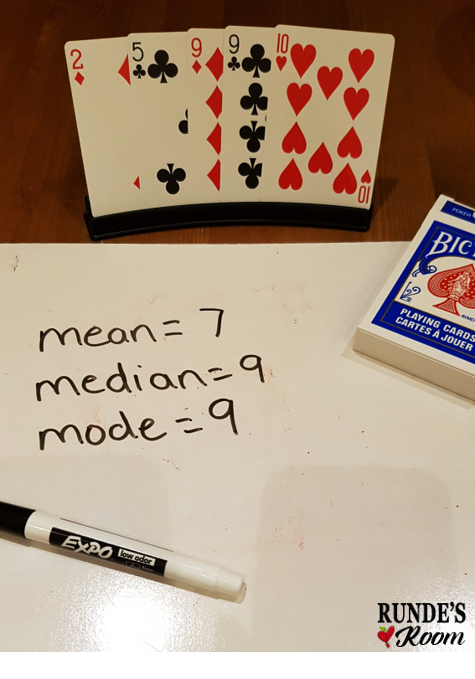 Pull out the dice or cards and the whiteboards, and give your students a task like "Choose 5 cards and find the mean, mode and median. Let a partner check your work. Then switch." Or "Roll 10 dice to make a set of data. 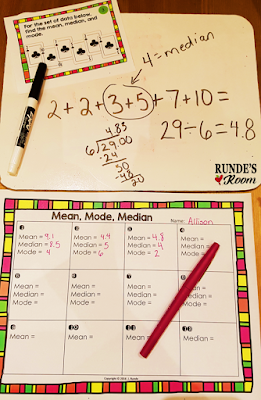 Find the mean, mode and median. 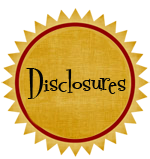 Then, re-roll two of the dice and see how that changes your data." 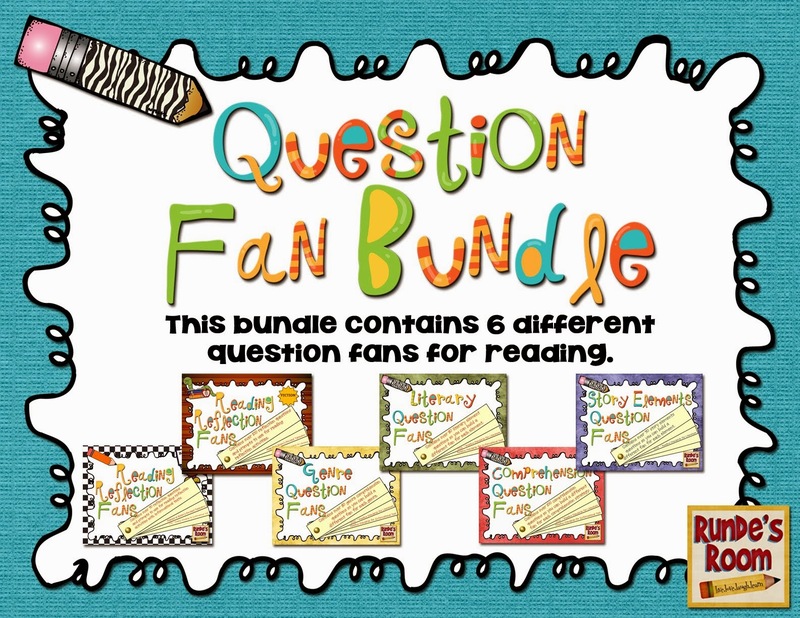 Have students complete a number of rounds at each station before moving on. 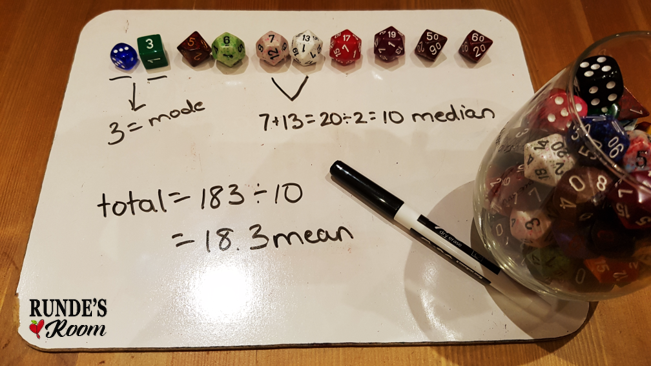 Add a little more fun to the stations by using a set of "fancy" dice, or giant cards. I just got a set of huge 5 x 7 cards from Amazon that I can't wait to use (affiliate link at the bottom of the post). I also made a set of Mean, Mode and Median Task Cards to use at a station. 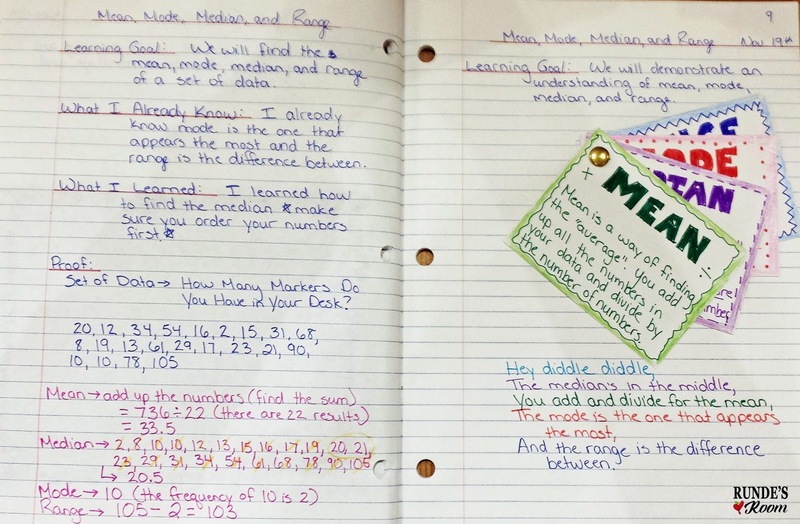 This resource includes a full page Minds-On Task which I use to introduce the station, a set of 12 task cards (ranging in difficulty from solving from a set of numbers, to taking the data from a graph, to finding the missing value in a set when given the mode or median), plus a journal prompt you can use for a written or oral response. It can also be used as an exit slip. 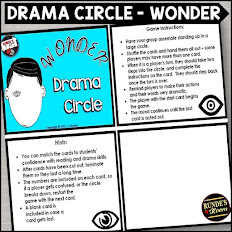 While my students are rotating through their stations, I like to work with small groups at a task card station - and then collect the recording pages for a formative assessment. 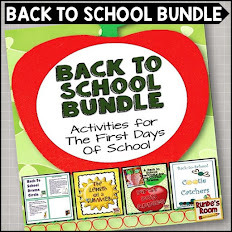 You can take a peek at this resource HERE or by clicking on the picture below. 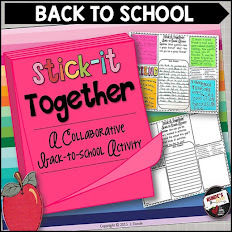 And lastly, if you have computers as a station, this LINK from Technology Rocks has a few fun online games to practice MMM.